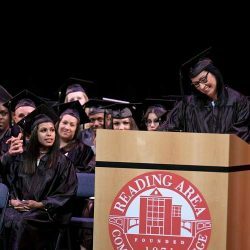 The Reading Area Community College (RACC) Adult Basic Education (ABE) program honored 108 students who have obtained their GED in a graduation ceremony on Wednesday, May 24th at 6:30 p.m. in the Miller Center on the RACC campus. Students walking the stage have spent hundreds of hours working on GED preparation in one of RACC’s classes. The GED examination is equivalent to a high school diploma and certifies a student as having high school graduate-level skills. This year marks the 74th anniversary of the GED diploma program. Many students graduating have also completed English as a Second Language courses and now plan to further their education-including enrolling at RACC to earn a degree. For more information about RACC’s ABE program, call 610.372.4721, ex. 5322.